Joanna Settle first read Guggenheim Award-winning Will Eno’s stage play, TRAGEDY: a tragedy (from which Night, Night was adapted, in 1999. Settle fell for the script, a modern, existential, and sharply intelligent drama-comedy about a television news team. While D13 presented a reading of the play in 2000, TRAGEDY: a gragedy still awaits its much-deserved American debut. It received its world premiere at The Gate Theater in London in 2001. 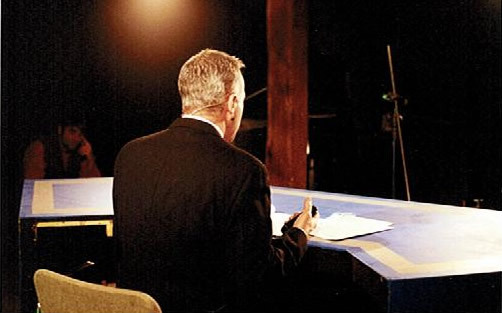 While D13’s original intent to fully produce TRAGEDY: a tragedy was not realized (due to purely fiscal constraints), Settle was fortunateto be approached by Chicago’s Bucktown Pictures about directing a film. She in turn approached Eno about adapting his text, as the script seemed an obvious match for D13’s interests and the available resources. Eno began work on his screenplay, and Night, Night went into production. 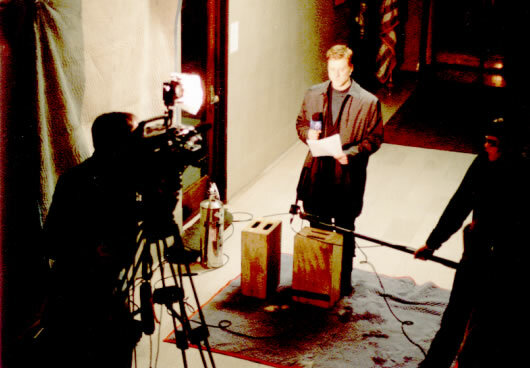 Executive Producer Philip Faversham was brought on board in conjunction with the team from Bucktown Pictures, D13’s members and artistic associates. 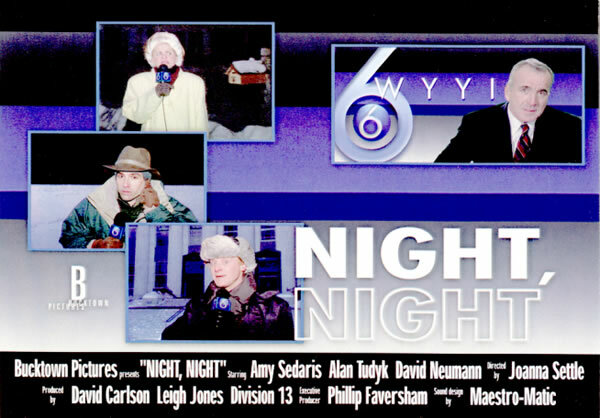 Night, Night was filmed almost exclusively with an outdoor, overnight shooting schedule (four shoots were scheduled from 4pm to 4am), in early December of 2000, during sub-zero weather. Heavy-duty outdoor heaters (resembling small jet engnes) were brought on-site, hot enough to melt the rubber on your boots. The film, which features Alan Tudyk and Amy Sedaris, as well as D13 Artistic Associate David Neumann, is currently in a state of rough edit, and has received one public showing at t Angelika Film Centre.